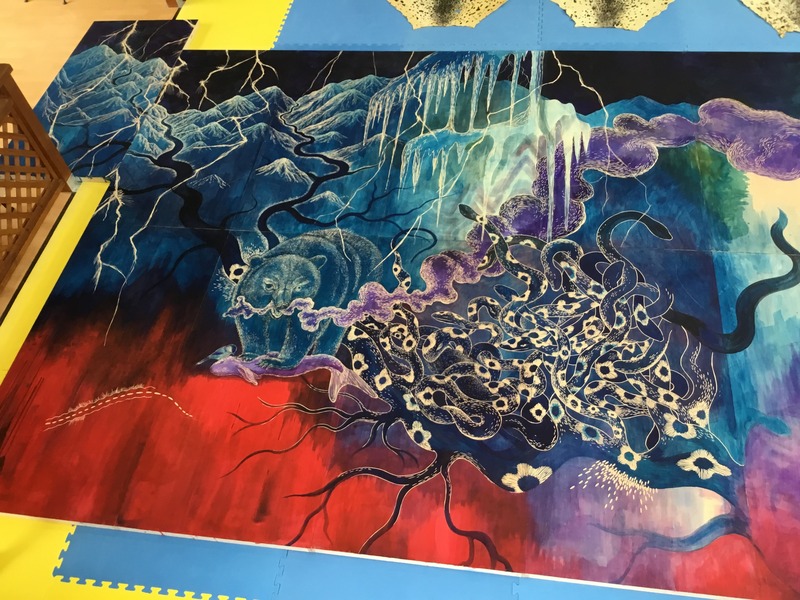 This autumn, feast on the otherworldly paintings of Japanese artist Tomoko Konoike. 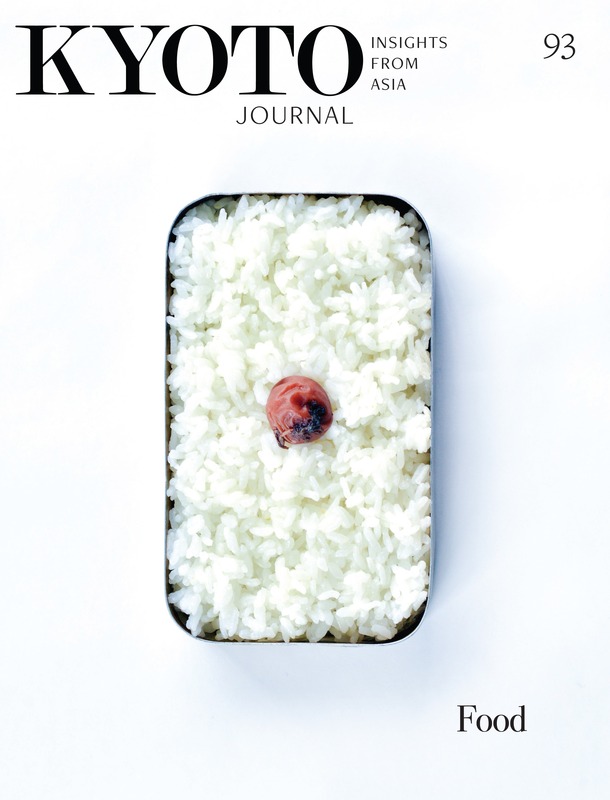 Here at Japan Objects we spoke to Konoike about her show: ‘Hunter Gatherer’ now on at the Akita Prefectural Museum of Modern Art until November 25, 2018. Tomoko Konoike is an multi-media artist based in the Akibara district of Tokyo and graduate of the prestigious Tokyo National University of Fine Arts and Music. With a practice already comprising of narrative paintings, ornate Japanese ink drawings, and ambitious outdoor installations all endowed with an ethereal sense of beauty and fragility, Konoike’s new exhibition builds upon the themes of her existing oeuvre, best described as inspired by nature with a distinctive hint of the occult. Wolves, skulls, insects and other animals populate her work, whether in sculpture or painting. At the same time, the objects of her work exude an eeriness that borders on the sinister. Her Fusuma Paintings, on the one hand, feature strange, menacing creatures — sometimes wolves, or butterflies, whose limbs have been supplanted by human appendages — that roam sliding doors adorned with grey skulls billowing smoke. In her outdoor installation series, “Inter Traveler,” only pairs of child’s legs with identical garb can be seen (. Her Narrative Paintings (, set in intergalactic universes or enchanted forests. Her upcoming, first large-scale solo exhibition includes a selection of new works as well as a few previously exhibited pieces. Inspired by the interaction between humans and their natural environment, the show focuses on the theme of the Hunter Gatherer. 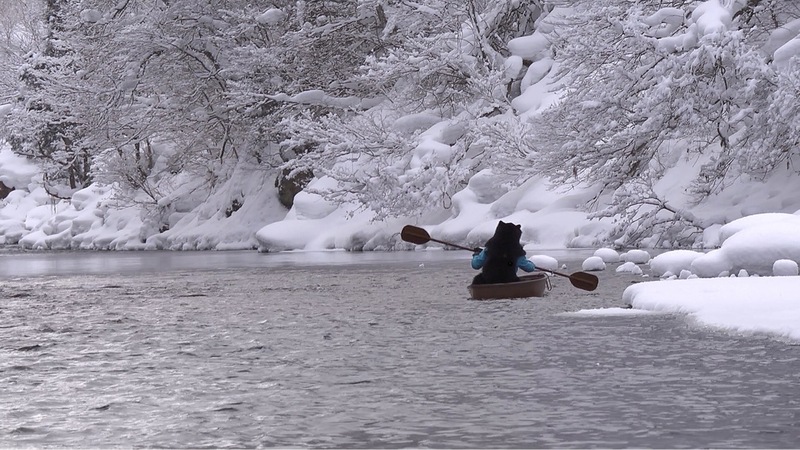 Highlights include an installation called Dream Hunting Ground, centered on the pelt of the indigenous moon bear; a film of the winter river of the Tohoku Region (Northeast Japan); and a project called ‘Storytelling Table Runner’, a series of individual stories of created with 150 pieces of sewing, knitting, and embroidery. 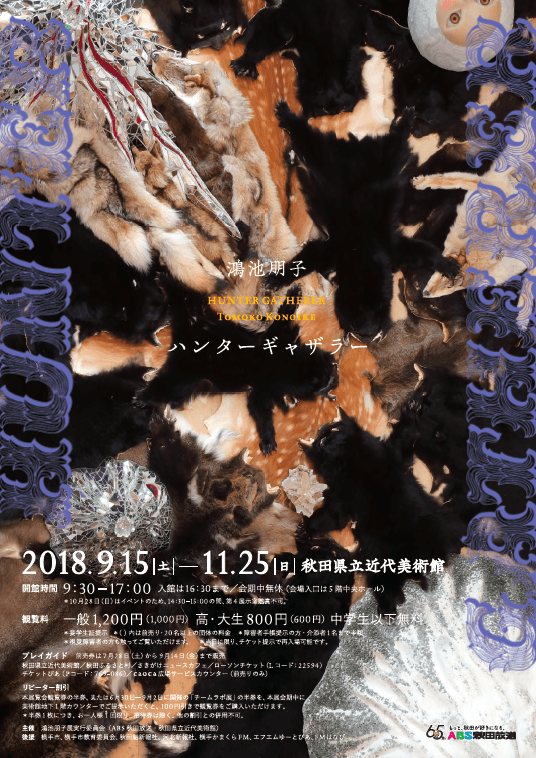 Within the exhibition at Akita’s Museum of Modern Art, photographs of hunter gatherers within icy environments, vibrant canvases of multicolored bears and snakes, and kaleidoscopes of animal-skin-like drawings adorn the walls of the gallery space. The multidisciplinary nature of Konoike’s practice is certainly felt: the beautiful intricacy of Konoike’s colourful drawings contrasting with the spaciousness of the installation-pieces. In this way, the exhibition encapsulates Konoike’s craft as a whole, which often magnifies small, minor or insignificant details such as butterflies, eyelids or spiderwebs. Her work charts from the microscopic to the monumental, and then back to earth again. “Hunter Gatherer” is the archetype of human manufacturing and cultures. I try to make art that can break down and convert the methods of ‘hunting’ and ‘gathering’ that have been developed to absorb the required energy into the human world in order to sustain human life. Having the opportunity to hold exhibitions in various places, I was quite busy moving actively among countries this year also. Every time when the arrangement of the artwork was finished, I left the museum and took a small trip to explore the local woods, cities, and landforms. The nature of each place had awakened my sensation extremely beyond exhibiting my works inside an art museum. Gradually, my body could not be compatible with how art museums are. That experience made me redefine my idea of art. We can’t wait to see more of Tomoko’s stunning works in the flesh. You can also check out more Japanese contemporary art at japanobjects.com (www.japanobjects.com).